At the Southern tip of Africa a deadly game of cat and mouse is played out over and over again in the salty waters off the fabled Cape of Storms. 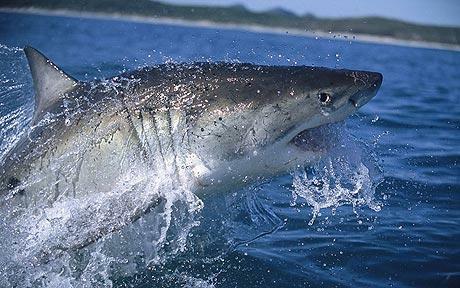 Each Southern hemisphere winter, between May and September, the infamous great white shark makes its presence felt through spectacular airborne breaches out of the inky depths around Seal Island in False Bay off South Africa’s Western Cape. It is well known that at Seal Island the great white sharks patrol the breeding colonies of Cape fur seals and their general hunting strategy involves swimming at depth to launch ambush attacks on the seals above, whose dark bodies are silhouetted against the light of the ocean’s surface. However, the range of tactics used by both predator and prey in this game of catch and be caught – or miss and survive – have until now remained a mystery. In a paper published in the October issue of the scientific journal Animal Behaviour a team of scientists from Simon Fraser University, the Save Our Seas Foundation (SOSF) and Marine and Coastal Management Branch of the Department of Environmental Affairs, explain what variables drive the tactical decisions of both shark and seal. A seal’s swimming and foraging behaviour tries to minimise the risk of being eaten by a shark; dicing with death, their strategy is aimed at avoiding attack. The sharks patrol using tactics that maximise their chance of killing; driven by hunger their payoff is a calorific, blubber rich meal. The breeding colony at Seal Island has a year-round population of between 36,000 and 77,000 seals, made up of an age mix from pups to breeding adults. With both pups and adults travelling from the colony to feed in open water and returning to rest or nurse, the shark population, it appears, is spoilt for choice. The team’s findings challenge traditional studies that consider predator and prey as uniform groups. Their study suggests that seals may not be equal players in the game, because seals of different ages exhibit a very different set of behaviours around Seal Island. The seals, which may stay away from the colony for several days or even weeks, appear to be at most risk from shark predation in the area between the shallow waters adjacent to the colony and about a distance of 1,000m out to sea. Well aware of the seals’ movements, the sharks concentrate within several hundred metres of shore, and the seals, well aware of the risk, select the best movement tactic to run the gauntlet. Both species base their game tactics on variables such as location, swimming depth, and the timing of departure and return. 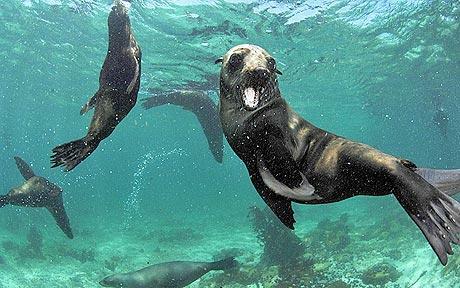 In addition, seals have the option to choose the size of group they travel in. Seals of all ages depart in large groups within two hours after sunset by porpoising in a southerly direction at the surface from the south side of the island. Group swimming ensures safety in numbers on departure, but because co-ordinating large groups requires synchronised timing and seals are solitary feeders, they often return to the island alone or in small groups. Most adult seals choose to return to the island under the cover of darkness, swimming at depth to avoid being conspicuous at the surface. The majority of pups return between 0700 and 0900 alone, around sunrise, over the deeper waters of the southern and western sides, and spend considerably more time swimming at the surface than the adults. The study revealed that it is precisely these variables that produce the greatest probability of attack. “It appears the pups do not account for risk in choosing their game tactics and the fact that sharks concentrate in the morning, mid-water, to the south suggests that sharks focus primarily on the seals playing a high risk game,” says co-author and SOSF scientist Alison Kock. The return movement of seal pups explains why shark hunting tactics seem more influenced by the riskier behaviour of pups than adults. The question remains, with the stakes so high, why do pups play such a risky game? The scientists are perplexed. Perhaps, it is naivety or a miscalculation of timing, or perhaps it is a trade off that avoids another risk. One thing, however, is for certain – great white shark numbers at many locations are plummeting due to overfishing, and it is studies like this one funded by the Save Our Seas Foundation that are essential for learning more about these apex predators before it is too late.